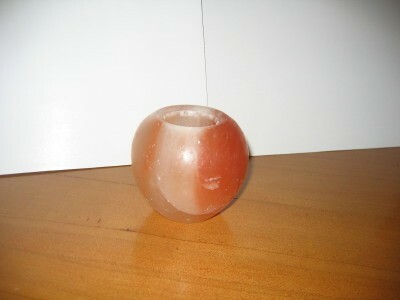 Drop a tea light candle in these Himalayan Natural Salt Crystal Holders and enjoy its incandescent flicker. Gently breathe and absorb the unique beauty and natural properties of this age old salt crystal. 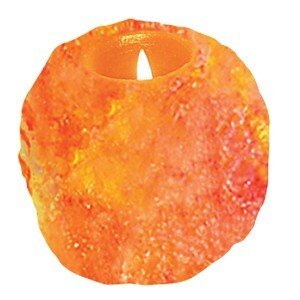 Rev up your romanticism in the incandescent flicker of a tea light candle gently placed in this beautiful salt crystal candle holder or simply bask in the delight of nature. Choose a salt crystal candle holder and own something special and unique. - No two are the same. Each piece is hand sculpted to preserve its own natural beauty. Choose from 5 different shapes; natural, heart, square, cylinder or apple! This salt crystal holder is made from rock salt sitting deep under the Himalayan Mountains for thousands of years, and is a one-of-a-kind gift colored by nature. 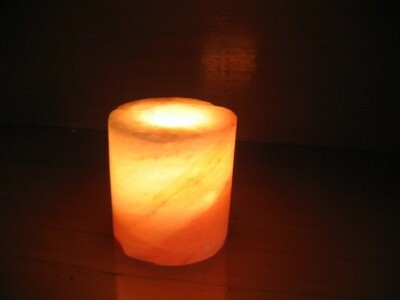 The warmth and glow from the tea light candle bring about a wonderful reaction with the natural crystal salt. It causes negative ions to be emitted in the air clearing out positively charged particles that make us stuffy and sluggish. The longer you keep the candle burning in the salt crystal holder the better the emission of negative ions. It clears the air and naturally dilutes odors so that we can breathe easier. People with asthma often find it helpful in reducing their symptoms and many medical practitioners recommend using these lamps to help relieve depression and fatigue. Ideal for your dinner table or place anywhere you want to be surrounded by clean air. It makes for a perfect gift for friends and relatives always think fondly of you when they recline in soft light, twinkling from a crystal salt candle holder! Always place the candle holder on a coaster and never leave a candle burning unattended. If you are interested in a beautiful and healthy experience, then you should consider these inviting natural salt crystal holders that will enhance the use of tea lights throughout your home. These unique items are an excellent addition to any home or office and can be used at any time of day to make a better atmosphere. Perhaps you have already heard about the salts that have been extracted from the Himalayan Mountains. These beautiful salts have been extracted and hand sculpted into these gorgeous candle holders. The salts themselves have properties that will help to purify the air in the room. Even though you do things to enhance your personal health and wellness, there are still ionic imbalances in your home. By using these all natural Himalayan salt candle holders, you will be able to increase the amount of negative ions in your home. This will clear the air and make it even easier for you to breathe. If you look at the research, you will see that negative ions are very important for those who are suffering from a wide range of ailments. From asthma to depression, there are all types of treatment protocols that can be supported by the use of these special lamps. In addition to providing excellent health benefits, the lamps are also aesthetically pleasing and will blend in nicely with virtually any home decor. You can use it to help clear the air of allergens and lingering smoke that might be in the air. Pet dander will be reduced and you can help deal with the various pollen and pollutants that are making the air in your space unhealthy to breathe. In fact, the use of negative ions for health improvement can be quite expensive in some places. The medical practitioners who specialize in the use of these special lamps and similar negative ion treatments can charge a lot of money. For many, that makes the treatment out of reach. However, you can get those same benefits in the comfort of your home with affordable alternatives such as these lamps. The more sources of negative ions you have throughout your home, the better off you and others will be as a result of the health boosting benefits! You can purchase these gorgeous salt crystal candle holders in one of five special shapes, so you can have the perfect shape for every location throughout your home. The first option is a natural shape, which gives you the most unique and interesting pieces that you can find. 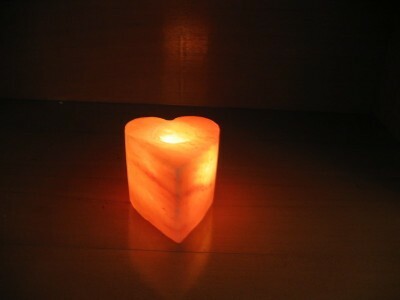 The heart is very popular, especially for those who are setting a romantic tone in the bedroom. Squares and cylinders are ideal for business and serious locations while the apple adds a touch of whimsy to the kitchen or any room in your home. You can purchase several different designs so that you will have gorgeous salt crystal candle holders throughout your home providing you with incredible health and wellness benefits. Check out the options and decide what you want in each room. Don't forget to add gift items to your list. If you know someone special with a birthday or other special event coming up in the future, you can be well prepared with a gift of these functional and attractive candle holders. Make sure you place on a safe surface before use and never leave burning candles unattended. 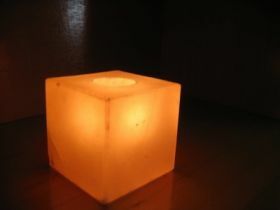 Then, you can relax and enjoy your natural salt crystal candle holders that you have selected for their natural Himalayan salt aesthetic and health-providing qualities that will benefit everyone who enters your abode.